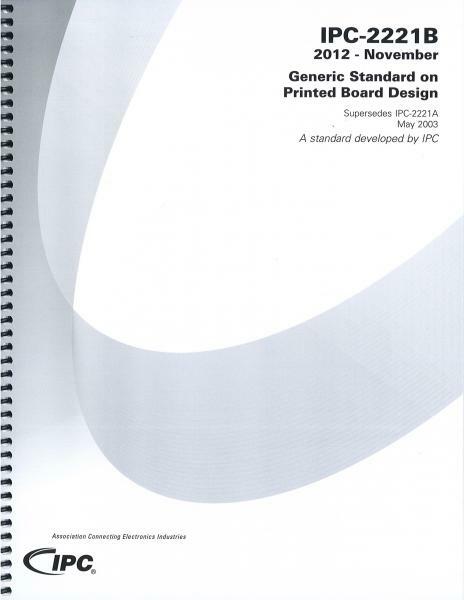 IPC-2221B is the foundation design standard for all documents in the IPC-2220 series. It establishes the generic requirements for the design of printed boards and other forms of component mounting or interconnecting structures, whether single-sided, double-sided or multilayer. Among the many updates to Revision B are new criteria for conductor characteristics, surface finishes, via protection, board electrical test, dielectric properties, board housings, thermal stress, compliant pins, panelization and internal and external foil thicknesses. Appendix A provides new test coupon designs used for lot acceptance and quality conformance testing. Released November 2012, 170 pages.